Is switching on turning your clients off? Tablets and smartphones have become as ubiquitous in brokering as in most other industries. There’s no shortage of technology pundits telling real estate professionals that mobile devices are the future of the industry, and that changing client preferences mean that real estate professionals need to jump on the mobile bandwagon. While there’s no doubt that mobile devices can be incredibly useful tools for brokers and agents, and can make client meetings much more interactive, some new research has pointed out potential downsides to the tablet and smartphone revolution. Interestingly, it all comes down to how the devices can affect your demeanor. New research from Harvard Business School has found that those who regularly use smaller computing devices, such as smartphones or tablets, are likely to be more timid afterwards than those who use laptops or desktops. “People are always interacting with their smartphones before a meeting begins, thinking of it as an efficient way to manage their time,” says Maarten Bos, co-author of iPosture: The Size of Electronic Consumer Devices Affects our Behavior. Despite this belief, it could actually do the opposite. The study found posture that contracts the body, such as folding arms or hunching over a small screen, decreases the levels of testosterone in the body. This can result in less assertive behavior, which can affect meetings. The research consisted of a 75-person experiment, in which applicants were given – at random – a smartphone, tablet, laptop or desktop computer. After a number of exercises, applicants were given $2, and told they could choose to take it, or go for a “double or nothing” gamble. While the results of who took the money and who gambled didn’t show correlation with the devices used, the true experiment lay in the researcher pointing at the clock and telling the applicant they would be back in five minutes to pay them. The applicants were told to come and get the researcher at the front desk if they didn’t return in five minutes. Instead of returning, the researcher waited up to 10 minutes and noted interruptions. While 94% of desktop users interrupted the researcher, laptops users were down to 88% and tablet users 71%. Only 50% of smartphone users interrupted the researcher. The results demonstrate an increase in meek and passive behavior in the short time after using a smaller device, which can mean skimming notes and emails in the moments before a meeting could make one less likely to speak up and show initiative. While this doesn’t necessarily mean real estate professionals should shun mobile devices before client meetings, it’s important to consider how using mobile devices can impact on how you relate to clients. 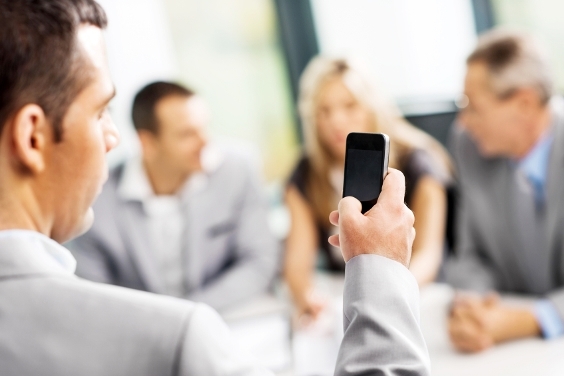 Assertiveness and initiative can be important to clients, and constantly checking your mobile device during a meeting could be a major turn-off.